was discovered by Charles Messier in 1764 and is a member of our Local Group of galaxies. This Sc-type spiral is an average sized one, though small as compared with the Andromeda Galaxy M31, and to our own Milky Way Galaxy. M33 is approaching our Solar System at 182 km/s. The red knot at 2 o'clock is one of the largest H II regions known beyond our Milky Way's own nebulae. With a diameter of nearly 1,500 light-years, it has a spectrum similar to M42 the Orion Nebula. M33 was among the first 'Spiral Nebulae' identified by William Parsons, the third Earl of Rosse. It was also among the first identified as a galaxy which contained Cepheid Variable stars. 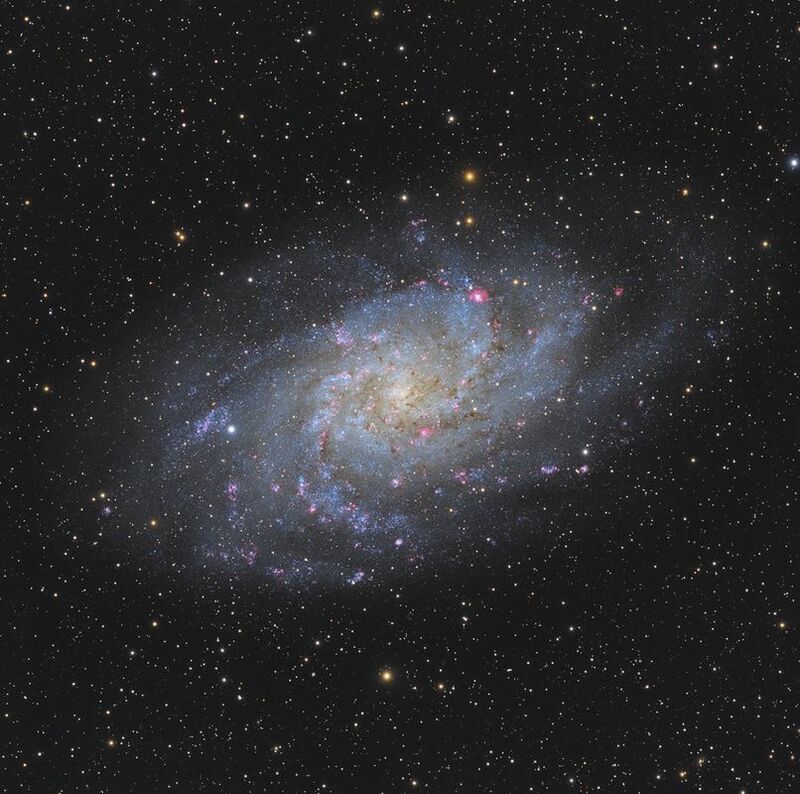 M33's diameter may be more than 60,000 ly. Its current distance is about 3 million ly from Earth, and approximately 750,000 light-years from M31. The pronounced arms exhibit numerous, pinkish H II regions as well as blueish clouds of young stars. Thanks to Dr. Barry Megdal's Nightfall Observatory - Polaris Obs. Assoc., Lockwood Valley, California for this wonderful data.